EMS is a 3D electromagnetic field simulator software suite, based on the powerful finite element method. 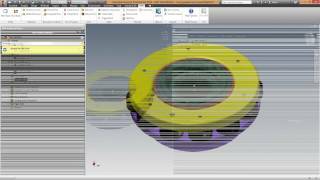 EMS is seamlessly integrated inside Autodesk® Inventor®. The full integration in Inventor means that users will not need to import, export, heal, clean, or fix any geometrical inconsistency because they will be working right inside Inventor while optimizing their electromechanical design. This will allow our users to shorten their design cycle and get their product to the market quickly. EMS targets four main areas: electromechanical, electromagnetics, power electronics, and electromagnetic behavior. EMS empowers the designer to compute electric, magnetic, mechanical, and thermal parameters - including, force, torque, magnetic flux density, magnetic field, electric field, electric flux, current flow, eddy current, inductance, capacitance, resistance, flux linkage, core loss, saturation, induced voltage, force density, power loss, temperature, temperature gradient, heat flux and more. EMS applications include: motors, generators, linear and rotational actuators, relays, MEMS, magnetic recording heads, magnetic levitation, solenoids, loud speakers, coils, permanent magnets, sensors, NDT, NDE, high power, high voltage, transformers, inverters, converters, bus bars, inductors, insulation studies, bushings, electrostatic discharge, electromagnetic shielding, EMI, EMC, medical devices, eddy current devices, fuses, circuit breakers, capacitors, etc. - New Non-linear solving module added to AC-Magnetic solver. - New Circuit Simulator module added to AC-Magnetic solver. - Normal flux can now be used as symmetry plane. - Symmetry factor and Normal flux multiplier are now used in solving. - Added “Compute B and H field derivatives” to Magneto-static solver results. I have only been using the trial version for a week, but I am very happy with the ease of use of this product and the seamless integration into Inventor. EMS seems to be among the most interesting applications full integrated in Autodesk Inventor as a 3D electromagnetic field simulator software suite.